I was so excited about this collection that I got up early and swatched them all! Maria was so generous to give all of the attendees at the latest Beauty Bloggers of Central Florida meetup the Cult Nails Fairy Tale Collection to review. I was so excited about these colors. They are all beautiful, and this is an amazing collection as a whole. Let' us get to it shall we? Feelin' Froggy is a kelly green with a light green shimmer. Evil Queen is a bright cherry red creme. Princess is a sky blue with subtle coppery shimmer. Charming is a sheer medium purple with a light purple shimmer. Happy Ending is a mixture of shredded red, blue, gold, and purple confetti-like glitter in a clear base. I am very impressed with this collection. I love the variety of colors, and I think they're all very representative of the Fairy Tale theme. I love the shimmer in Feelin' Froggy and Charming, it gives these colors a unique twist. Princess is a beautiful blue, and I'm a sucker for copper shimmer! If you have Sinful Colors Cinderella, you can toss it aside for Cult Nails Princess. Princess is not sheer, and has great coverage. 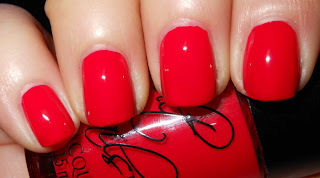 Evil Queen is the perfect pinup bright red. 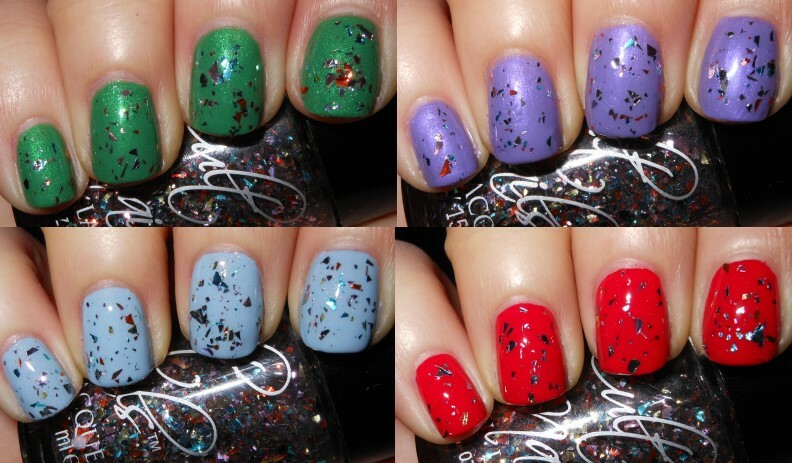 The shredded multi-colored glitter in Happy Ending is great layering top coat, and looks great over all of the colors in this collection. All of these were an average of 2-3 coats, with the exception of Charming which took 4. The pre-sale for this collection will be from Sat. May 26-Sat. June 2. The pre-sale price for all of these will be $40. If you want more information on the pre-sale check out Maria's post. 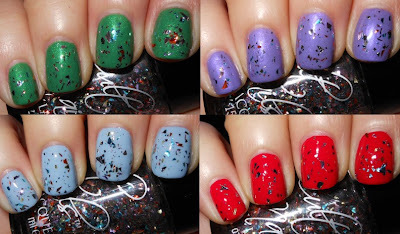 I want to thank Maria for giving me the opportunity to review these polishes. They are great! *These products were provided to me for review by Cult Nails. I'm a sucker for anything Fairy Tale related so I NEED these. Really glad my dad just gave me birthday money 3 months late. It's perfect timing really. I love this! They are all so cute and aptly named! What a fun collection! I love the names, and Evil Queen looks like such a great red. gorgeous! need after party & the blue. I love the idea behind this collection, it's really cute. Princess does look similar to Sinful Colors Cinderella, although not a perfect match, and Happy Ending looks kind of like Icing After Party. Really pretty collection overall. WOW I love Happy Ending!! Feelin' Froggy looks like a gorgeous green. It definitely has a fairy feeling because of the shimmer, so it fit into this collection so well. :) Thanks for swatching this collection! These look gorgeous! I can't wait to order! I love Evil Queen and Happy Ending! So jealous! Oooh, I really like Princess! you have me sold!! i love your swatches,,.. Such a pretty collection! Thanks for sharing ;0). I especially love Evil Queen and Princess ♥. I was really hoping I wouldn't like this entire collection...now it looks like I'm going to be pre-ordering! So pretty! Central Florida Beauty Bloggers Meet Again!